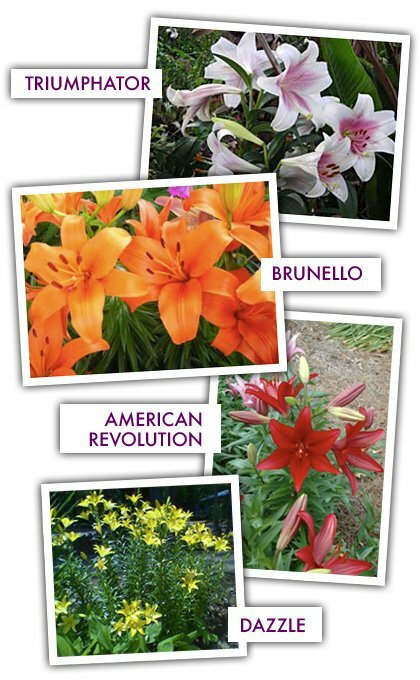 Let us introduce you to absolutely the best naturalizing lily for Houston! These lilies are superior new cultivars obtained by crossing the Longiflorum (Easter lily types) with the Asiatic (LxA) or Oriental (LxO) lilies. Their Longiflorum parent provides height and a strong, supporting stem they seldom need staking. Their Asiatic or Oriental parent provides fragrance and bright color. Truly a perfect marriage! 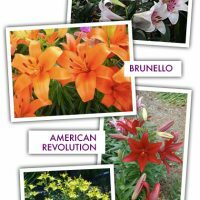 These lilies explode into bloom in the spring with 6 long, fragrant flowers. Their petals are thick, making them durably weatherproof. They make excellent cut flowers & are especially long lasting if you remove the pollen anthers after the flowers open. Bright green basal growth will emerge in late winter. The bloom stalks will grow 4 tall with thick stems that seldom need staking. Some varieties have displayed as many as (20) flowers per stem after the clump has matured a few years. You can expect shorter stalks and fewer blooms for the first few seasons. They have a long blooming period, and may flower even into the heat of early summer. Plant in full sun, in beds with improved soil & good drainage. Plant soon after purchase and at the same depth as the soil in the container or up to an inch or so deeper. This will place the bulb 4 6 below soil level. Mulch well with a light material such as pine straw. These lilies are virtually carefree. They are seldom bothered by disease or insects. This series is dependably perennial if you allow them to die down naturally in the fall. Bulblets will form along the stem below ground level to increase your clump size. The mother bulb can eventually attain the size of a small cantaloupe. Explodes into bloom in the spring with 6 long, fragrant white flowers with beautiful maroon to rosepink throats. Their thick petals are durably weatherproof, & are especially long lasting if you remove the pollen anthers after the flowers open. Excellent for cutting, dependably perennial. Grows 4 tall with thick stems that seldom need staking. Allow to die down naturally in the fall bulblets will form along the stem below ground level to increase your clump size. Plant in full sun, in beds with improved soil & good drainage. Explodes into bloom in the spring with 6 long, fragrant pumpkinorange flowers. Their thick petals are durably weatherproof, & are especially long lasting if you remove the pollen anthers after the flowers open. Excellent for cutting, dependably perennial. Grows 4 tall with thick stems that seldom need staking. Allow to die down naturally in the fall bulblets will form along the stem below ground level to increase your clump size. Plant in full sun, in beds with improved soil & good drainage. Explodes into bloom in the spring with 6 long, fragrant, pure red flowers. Their thick petals are durably weatherproof, & are especially long lasting if you remove the pollen anthers after the flowers open. Excellent for cutting, dependably perennial. Grows 4 tall with thick stems that seldom need staking. Allow to die down naturally in the fall bulblets will form along the stem below ground level to increase your clump size. Plant in full sun, in beds with improved soil & good drainage. American Revolution is RED. Explodes into bloom in the spring with 6 long, fragrant lemonyellow flowers. Their thick petals are durably weatherproof, & are especially long lasting if you remove the pollen anthers after the flowers open. Excellent for cutting, dependably perennial. Grows 4 tall with thick stems that seldom need staking. Allow to die down naturally in the fall bulblets will form along the stem below ground level to increase your clump size. Plant in full sun, in beds with improved soil & good drainage.